Bur Reed is a tall grass-like plant with distinctive prickly-looking flowers. Bur Reed is about 2-6 ft. long with alternating blade-shaped leaves along with a central stem. Each leaf is medium-green, smooth, and keeled on one side. Bur Reed have distinct sphere flowers that are green and prickly in appearance. The buds on the flowers are a pale yellow, but when in full bloom, the flowers are white. The blooming period occurs during the summer and lasts about 2-3 weeks. Bur Reed is common all around the United States. Bur Reed is spread by seeds. 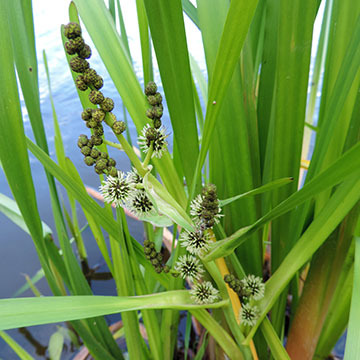 The flowers on the Bur Reed are spread by wind pollination. Treat Bushy Pondweed with Aquathol K® herbicide. Other alternative treatment products include: Hydrothol. You can order these products on this website.